For more detail see my current list of publications and older publications including my thesis. 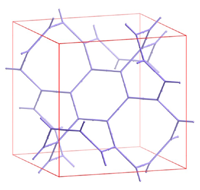 Crystalline structures from solid-state chemistry are a wondrous playground for geometers and topologists. Using existing structures as inspiration, we are exploring the systematic generation and classification of periodic 3D networks by wrapping 2D hyperbolic tilings onto periodic minimal surfaces. The technique involves Delaney-Dress tiling theory, group theory, differential and non-Euclidean geometry. Most of our results are available at EPINET, our online database of tiling and network structures. Stephen Hyde, Mohammad Saadatfar, Nicolas Francois, Gerd Shroeder-Turk We are beginning to use the epinet database to explore physical properties of networks. 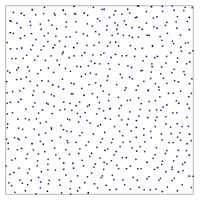 Percolation is one of the simplest models of a phase transition in physics. It has been used to model critical phenomena in resistor networks, forest fires, epidemics, and even social influence. Each site(vertex) of the net is occupied independently with probability p, and the clusters of connected sites are studied as a function of p. Computer simulations remain an important tool in the study of percolation because relatively few exact results are known. The percolation threshold is particularly elusive from the theoretical perspective. We are investigating correlations between percolation thresholds and parameters such as vertex-coordination, ring sizes, topological density, and Euler characteristic. The study of rigidity of finite frameworks (or networks) goes back to Maxwell. The standard model assumes edges are rigid segments that are free to pivot arbitrarily at the vertex joints. By studying the rigidity matrix associated with the unit cell of a periodic network we have a fast and simple method to estimate network flexibility. This may provide valuable information for materials design since many mechanical properties are fundamentally influenced by the rigidity of their underlying frameworks. As an example, we look for the anomalous expansions of auxetic, i.e. negative Poisson's ratio, materials that expand when stretched. Tomographic facilities the world over are enabling us to peer inside an enormous range of complex materials with unprecedented clarity and resolution. Armed with X-ray microtomographs, synchrotron beamlines, positron emission tomographs or even electron microscopes equipped with rotation stages, our ability to image complex structure in three dimensions, on a range of length scales, has advanced enormously in the past decade. The need to study these data sets in a quantitative manner has resulted in a new computational discipline dedicated to the processing of large 3D images and to the characterisation of the complex structures that are now being unveiled. One of the most fundamental descriptions of on object is in terms of its topology - how many connected components, handles, and enclosed voids it has. 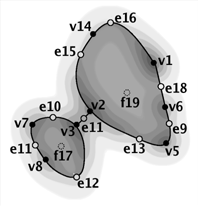 Topological persistence is a method for distinguishing between features that are significant and those that are introduced by noise. Edelsbrunner and Zomorodian and others introduced theory and algorithms (largely based on simplicial complexes) for studying persistence. We are adapting these ideas to the segmentation and morphological analysis of large 3D digital images (up to 4000^3 voxels). Topological measures of shape are finding increasing use in the study of point or coverage processes. This is because topology is independent of geometry, and so both types of information are necessary to fully characterise spatial structure. 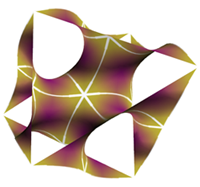 The most commonly studied topological quantities to date are the number of connected components (B_0) and the Euler characteristic (chi). We are exploring the use of higher order Betti numbers (B_1, B_2) that count the number of handles and enclosed voids in the characterisation of point patterns from condensed matter physics. Examples include atomic arrangements in fluids and glasses, and particle centers from colloidal suspensions and bead packs. The computer implementation uses the Delaunay Triangulation and Alpha shape packages from the open source Computational Geometry Algorithms Library, CGAL. Student research projects are available in all of the above topics. Please contact me if you are interested. I usually supervise one or two undergraduate research projects each semester within the PhB and Summer Scholar programs at ANU.